The public art project Pledges of Allegiance is coming to an end. 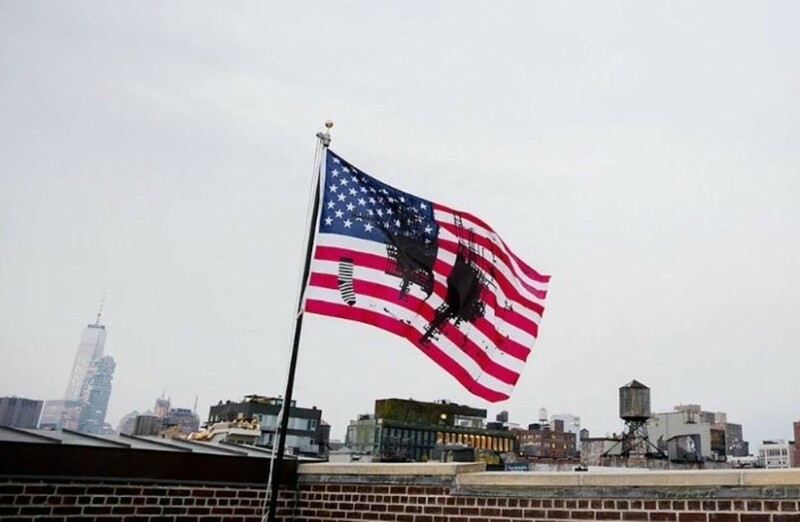 Creative Team, a New York-based nonprofit, launched the ambitious project on June 14, 2017, on Flag Day, Artforum writes. As part of the project, 16 artists created their versions of the American flag, addressing political issues they are passionate about. The flags were then raised over participating cultural institutions across the country. The last flag named Untitled (Flag 2) was designed by artist Josephine Meckseper and flown on July 3. Her work is a collage of the fragments of one of her earlier project, Goodbye to Language. It features a black-dripped colour field that resembles a United States map, divided in two. Commenting on her work, the artist said it shows how polarised America has become after Trump came to power. The flag will be flown at 13 cultural institutions and universities in 11 states – Florida, Kansas, Maine, Michigan, Missouri, Nebraska, New Jersey, New York, North Carolina, Rhode Island and Texas.